The West Midlands League at Shoal Hill, Cannock Chase, saw some fine wins for club members. Organised by Walton Chasers the long course of 9.2km with 175 metres of climb saw Alistair Landels M45 win in 52.25mins, over 5 mins ahead of Potteries Club Martin Pigott, Alistair Powell M35 was 7th and Sam Leadley M18 was top junior in 71.39mins. Top juniors on the Blue 6.4km course were Oliver Flippance M16 41.57mins and Felix Lunn M16 45.24mins and on the same course Anne Straube W40 was top woman taking 49.03mins. Bruce Bryant M60 clocked up 31.23mins to take 2nd place just 41 secs behind winner on the 4.5km Green course, Juliette Soulard W45 was top woman in 35.31mins on the same course. Top three on the Light Green 3.9m course were: Florence Lunn W14 40.58mins, Pippa Smart W14 50.37mins and Tabitha Lunn 51.26mins. Matt Bambrook M14 won the Orange 2.9km course in 36.25mins and Finley Flippance M12 was 2nd in 40.56mins. Adam Landels M10 was 3rd on the White 1.5km course taking 13.54mins. OD now lead the league with 6946 points after 8 events and contributing to this score are 5 members who have scored the maximum 500 points: Finley Flippance M12, Josie Smart W12, Tom Jeffries M45, Peter Carey M70 and Sheila Carey W70. 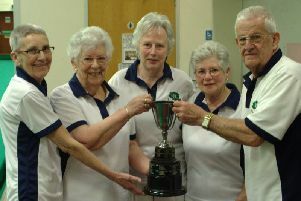 Representing the club in the Compass Sport Cup Final national inter club competition, held near Yelverton, Dartmoor, several club members achieved some great results in their age classes. A maximum of 100 points is awarded to competitors coming 1st in their class. Of the 22 counters for the club, Lesley Ross W50 was the top scorer achieving 99 points, Juliette Soulard W45 was awarded 97, Felix Lunn M16 96, Barry Elkington M60 96, Mike Hampton M70 95, Richard Gardner M60 94, Alistair Landels M45 94, Peter Carey M70 91 and Florence Lunn W14 90. OD, scored a total of 1835 points and Bristol Orienteering Club were the winners with 2363 points. At the British Schools Score Championships several club juniors represented their schools, some for the first time. The venue was Rother Valley, near Sheffield, and podium places were achieved by Florence Lunn 2nd in the Year 8 Girls scoring 170 points after finding 17 controls within the time limit of 45 minutes, Oliver Lunn 2nd Year 10/11 Boys with 230 points and 3rd Oliver Flippance 225 points, also Year 10/11 Boys, and Hannah Matthews 3rd Year 12/13 Girls 180 points.